A frenotomy of frenectomy is a procedure that consists of releasing the frenum under the tongue or upper lip to allow for better range of motion. 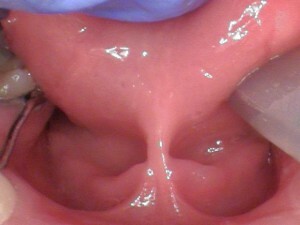 Children may be born with a combination of conditions called a tongue-tie (ankyloglossia) and/or a lip-tie causing restrictions in movement that can cause difficulty with breastfeeding, and in some instances, other health problems like dental decay or spacing, speech and airway difficulties, and digestive issues. These issues can generally be corrected by a simple procedure done with our soft tissue laser. Why is Solea® better than conventional treatment? No scalpel. No Scissors. Using the Solea®, the doctor gently severs the frenum from its attachment using laser pulses, without even touching it. Precise and effective, the laser frenectomy causes virtually no bleeding, tissue trauma nor charring. In just 3 to 5 minutes, the procedure is complete. Within 10 days, new skin is evident and the frenum attachment is at least 5 mm higher up. Even immediately following the procedure, children can eat and function normally. Some patients report a little soreness to the area for a couple days, however, there is no need for stitches, meaning dramatically less discomfort and shorter healing times. Laser Frenectomy – How Does It Work? A soft tissue laser does NOT cut, it is more a “vaporization” of tissue that occurs with light energy. There is very little discomfort with the laser. Some babies and children sleep through the procedure. There is almost no bleeding from the laser procedure. Lasers sterilize at touch therefore have less risk of infection. The healing is very quick – a laser stimulates bio-regeneration and healing. The result is beautiful tissue, less chance of relapse. Tongue-Tie – What Does It Really Mean? Normal tongue function is important for multiple reasons. Among the many benefits, normal tongue function will allow a baby to latch adequately and breastfeed efficiently, promote normal speech development, make it possible for a child to self-cleanse the mouth during eating, allow adequate swallowing patterns, allow for proper growth and development, and it makes fun little things like eating ice cream, kissing or sticking your tongue out to catch snowflakes possible. How Can A Lip-Tie Affect My Child? Why Have The Tongue-Tie And/Or Lip-Ties Released For My Baby? What Can I Expect After The Laser Frenectomy Is Done? Breastfeeding immediately after the procedure is fine as breast milk contains amazing healing properties and the simple act of breastfeeding will reassure and soothe the baby. It is possible that latching will be a struggle at first since we are using a small amount of anesthetic to complete the procedure. The numbness will wear off about 30-45 minutes after the procedure. Do not be alarmed if latching is difficult at first. 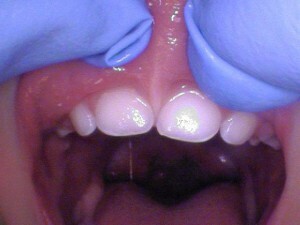 Posterior tongue-ties may require a few weeks of practice before seeing the benefits of the frenectomy. We recommend to be thorough with the prescribed post treatment exercises and to work with the lactation consultant and possibly a bodyworker (cranial sacral therapist, pediatric chiropractor, etc.) to increase the chances of success.